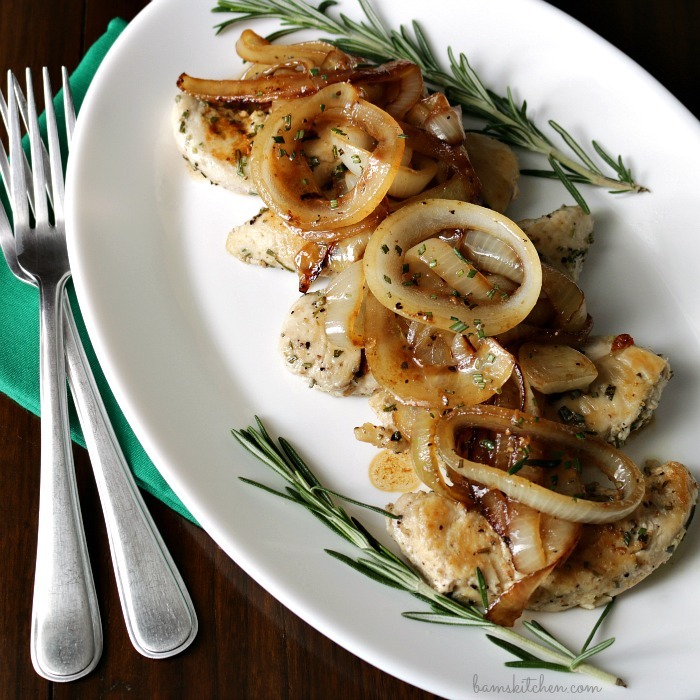 Rosemary Chicken with Sautéed Onion Wine Sauce is made with deliciously aromatic rosemary chicken tenderloins topped with simple caramelized onion sauce is a little one pan wonder. 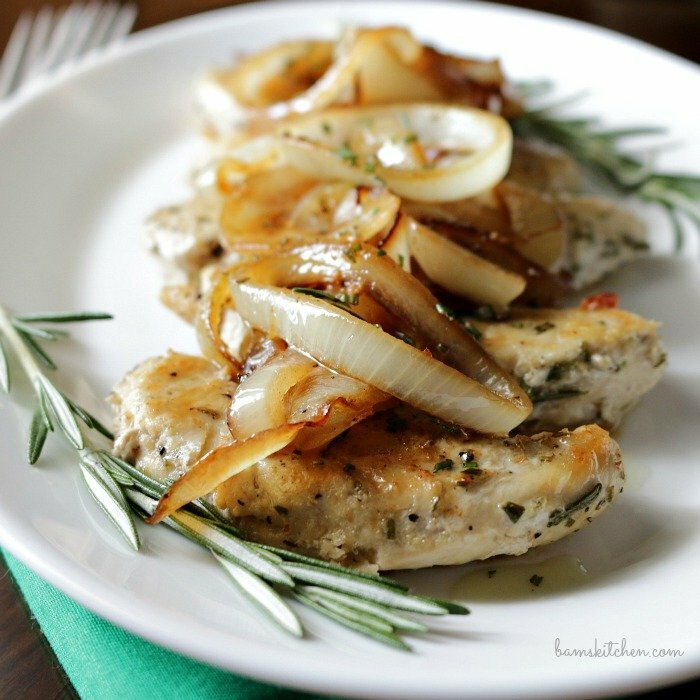 You are just going to love this Skinny Spring simple and fresh Rosemary Chicken with Sautéed Onion Wine Sauce using just a handful of pantry ingredients and less than 30 minutes of your time. 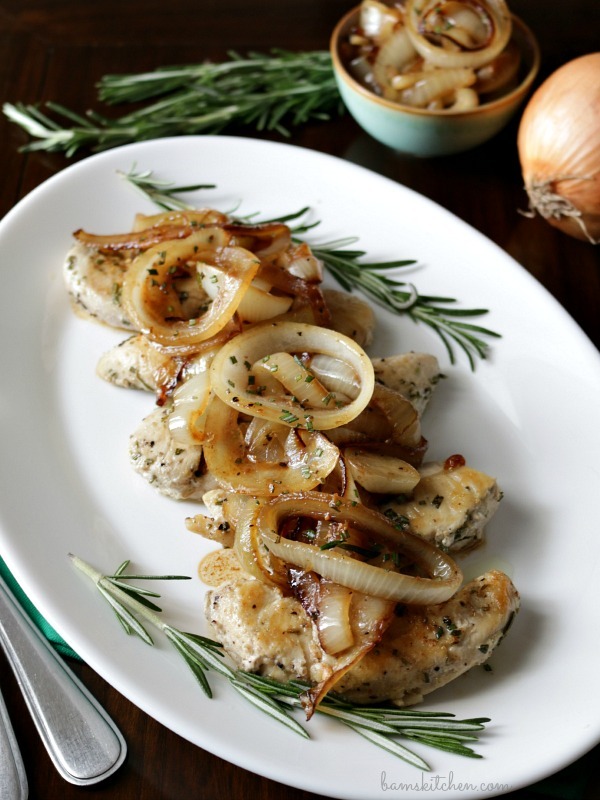 Rosemary chicken and caramelised onion sauce is gluten-free, dairy-free, cardiac friendly, low-carb, diabetic friendly and simply delicious. I have been having loads of fun growing my own fresh herbs here in Bam's Kitchen. My kitchen window seal is decorated with fresh rosemary, thyme, basil, parsley, Thai basil, mint, and of course my dear bonsai and lucky bamboo plant too. Growing your own herb garden is so easy to do and it is convenient having them right there in my kitchen. Adding fresh herbs to your dishes, takes your dishes from "ho hum" to "out of this world" as they are vibrant and so aromatic. I have found that growing herbs from a seedling is far easier to do than planting it from seeds and nurturing them to a sturdy plant. I am impatient and want to use my herbs on a daily basis. You can buy fresh herbs here in the grocery store pre-sealed in a container and I found that the herbs in plants are only a few cents more and will get tons more product from them so it is penny wise as well. See if I can actually grow things, so can you! If you are keen on gardening, please visit my blogging buddies Garden to Wok, Brooklyn Farm Girl and Promenade Plantings as they can show you the way. Rosemary and chicken are a like a little match in heaven. I used chicken tenderloins as they are so easy to prepare and they cook up in no time at all making this an easy weeknight meal. Our family tries to eat relatively healthy which means loads of chicken, fish and vegan recipes. Sometimes boredom sets in we need to really change things up a bit to make boneless and skinless chicken exciting again. 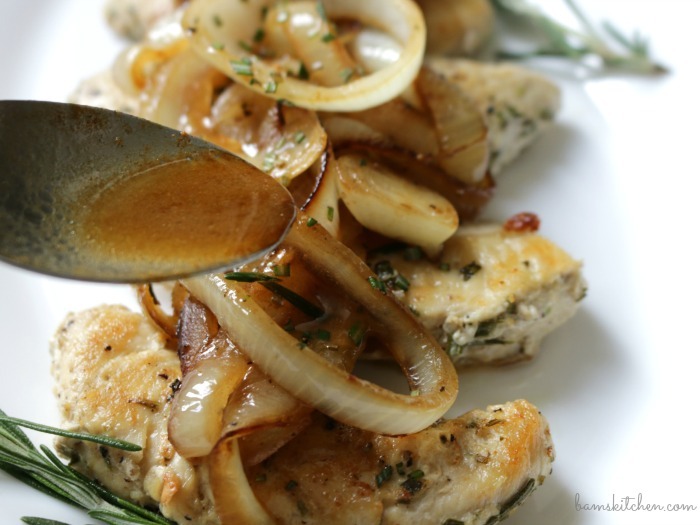 A simple and very economical way to change-up your chicken breasts it to add naturally sweet and delicious carmelized or grilled onions on top of your chicken and with a simple wine sauce just makes this simple dish lip smacking good. I served this delicious Rosemary Chicken with Sautéed Onion Wine Sauce meal with a lovely tossed salad and green beans. Low carb and beautiful! 2Add the sliced onions to the pan and add 1 teaspoon of rosemary and salt and pepper to taste. 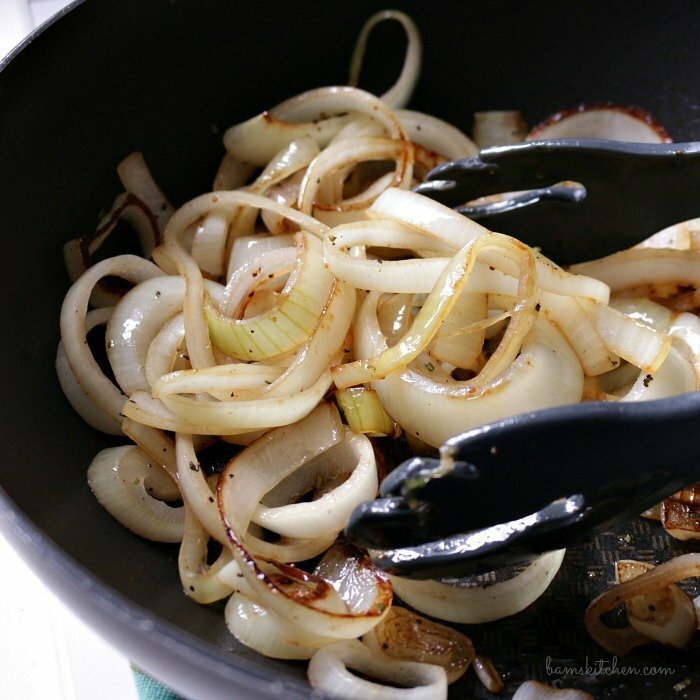 Saute onions until slightly golden brown but still have a nice little aldente crunch about 5-8 minutes. Remove onions from the pan and keep warm. 3Add white to pan and deglaze pan for about 2 minutes to allow the alcohol to burn off. Add the chicken broth to the wine sauce and allow to reduce sauce to reduce by half. Check and adjust seasoning. 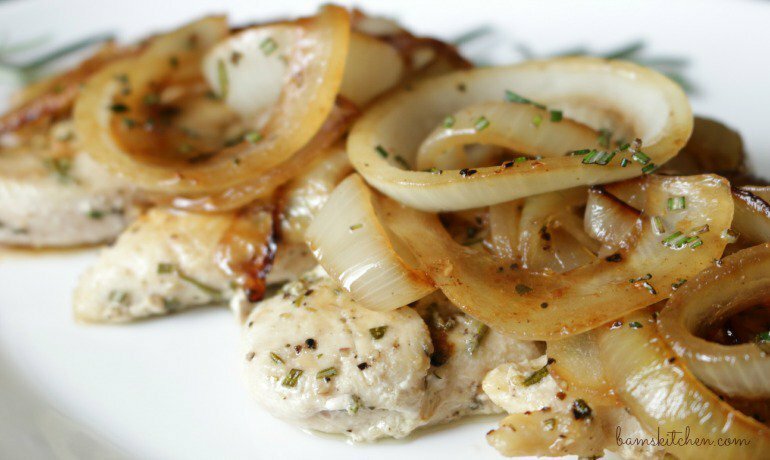 Add the cooked chicken and onion back to pan to rewarm and then add margarine/butter to the pan and remove from the heat. Stir to melt the margarine/butter. 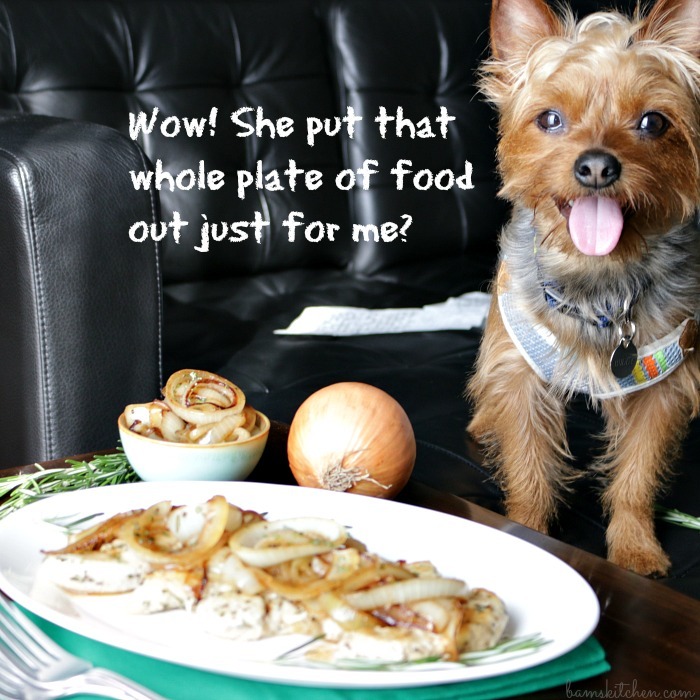 4Serve Rosemary Chicken with Caramelized Onion Sauce on a plate with chicken on the bottom mounded on top with onions and drizzled on top with the wine sauce. Enjoy!